CBS wants to make Super Bowl 50 the biggest TV event in history. The network has laid out a week long program packed with Super Bowl 50 content. To drum up the hype, CBS launched a new promo video starring no other than Rihanna. The promo video promotes at the same time the Super Bowl 50 and the Grammys 2016. Stephen Colbert is "flipping off" CBS's team for the Super Bowl 50 including Jim Nantz, James Brown and Phil Simms against Rihanna representing the Grammys 2016. Super Bowl 50 wins the coin toss and goes first. Rihanna's response: "She is worth the wait." The Grammys 2016 will be broadcasted on Feb. 15 hosted again by LL Cool J. The promo around a coin toss just got new context with the filled coin flip in the playoff game between the Green Bay Packers and the Arizona Cardinals. The coin did not flip and the whole incident sparked a controversy. The Packers blame the botched coin toss for the loss against the Cards. 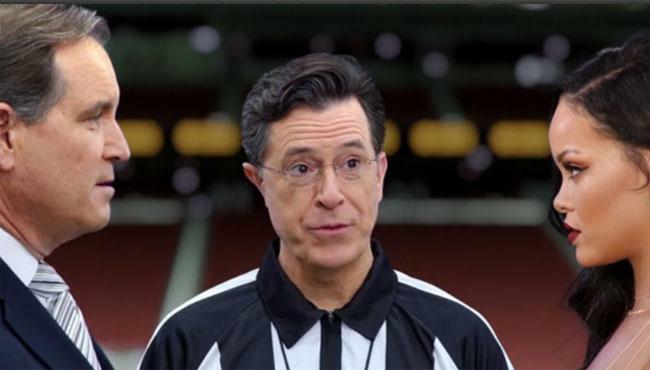 Watch the entertaining CBS Super Bowl 50 promo below.